1938. Stonehenge Brickwork, right standing Lewis Emmett, sitting near Norman Bastow, Edward Dicker sitting in midle MD. By kind permission Lewis Emmett Junior. Sand from pits in and around Leighton Buzzard and Heath and Reach proved to be suitable for the production of bricks and tiles used in the building industry. Manufacturers began to move into the area to take advantage of the readily available raw materials. 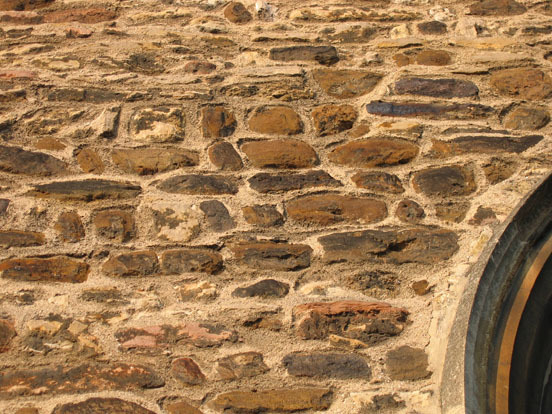 Arthur Blackman, a builder from Hastings, had some success with making bricks and tiles. 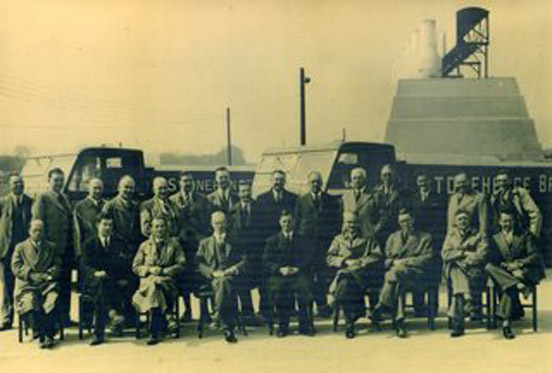 After his friend Owen Aisher moved to Leighton Buzzard and founded Marley Tiles, he decided to do likewise and in 1935, set up Stonehenge Bricks Ltd at a site on Mile Tree Road, producing calcium silicate facing bricks made from sand and lime and employing 150 men. Lewis Emmett senior was one of these men he came from Manchester to be a manager, his son talks about that. In 1949, a subsidiary company was set up on a site adjacent to the brickworks, manufacturing cement roof tiles. The sand for the bricks was transported from the quarries to Stonehenge by the Leighton Buzzard Light Railway. The brickworks prospered, and in 1961 a brick press was purchased and the plant was modernised. However, by 1966, the number of bricks being produced decreased. Whilst at the brick works William Cosby was asked from time to time to work for the Stonendge Tile factory so then few fears later he went to work there. In 1974, the brick works was acquired by Redland Tiles. The Stonehenge plant outlived its usefulness and today is the site of the end of the line for the Leighton Buzzard Railway. Work on rolling stock is carried out here, and visitors can wander around the museum or take a cup of tea in the café. All records kindly donated by Lewis Emmett Junior. The Romans introduced roofing tiles to Britain, but it was not until the twentieth century that due to the easy access to sand, the manufacture of roofing tiles came to Leighton Buzzard. Many of the houses in the area had been thatched or roofed with Welsh slates. With the local production of sand and cement tiles, all new houses were built with tiled roofs. Marley Tiles: in 1928, a company based at Sevenoaks in Kent, began to manufacture sand and cement roofing tiles in Stanbridge Road. The site was chosen because of its proximity to a good supply of sand from local quarries. The tiles made, varied in size and colour. Today, The Marley Tile Company is still a major employer in the town, now making thermoplastic floor tiles. The Leighton Buzzard Tile Company: in 1930 began operations from a site in Grovebury Road. In 1936 it was taken over by Eastwoods Ltd, a national cement company. The Speight Tile Company: the manufacture of roof tiles began around 1930 close to the Leighton Buzzard Tile Company. Production on the site ceased in 1954 when the company was also taken over by Eastwoods Ltd.
Redland Tiles: The Leighton Buzzard Tile Company was acquired from Eastwoods in 1963 and the manufacture of roof tiles continued at Grovebury Road until 1979. A very modern fully automated factory was built on the Dri-Roof site in Vandyke Road and production moved there. Today, using new laser sensor technology, the Redlands factory produces 67,000 roof tiles in a twelve hour shift. Anchor Roof Tiles Ltd: concrete roofing tiles were produced by this company in Leighton Buzzard from 1945 and there was some competition with both Marley and Redland Tiles. When new machinery was installed in 1974, Anchor Tiles had one of the most advanced fully automated tile handling plants in Europe. Sales of tiles were mainly to local authorities, and many were used for re-roofing in London and the Southeast. The company received a number of takeover approaches from both Marley and Redland Tiles but was eventually acquired by Forticrete in 1981. 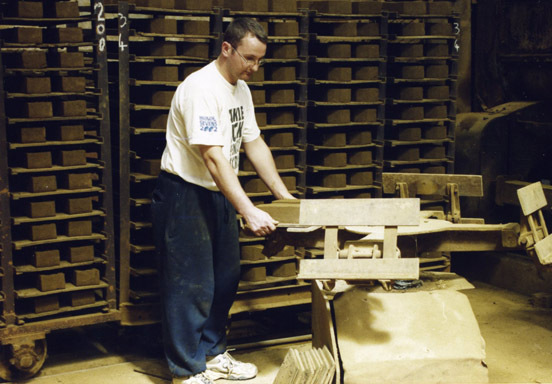 Tile making using locally quarried sand, still takes place at Boss Avenue just off Grovebury Road. “All About Leighton Buzzard and Linslade” a Local Guide to Leighton Buzzard and Official Guide to Linslade for the Linslade Urban District Council.